[11/02/2013] Wow. 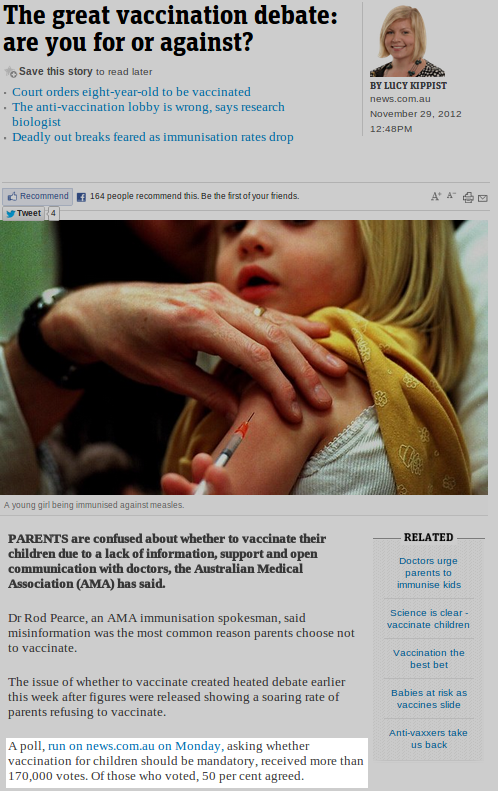 This story just featured on ABC’s Media Watch. Click here for their article (with video). 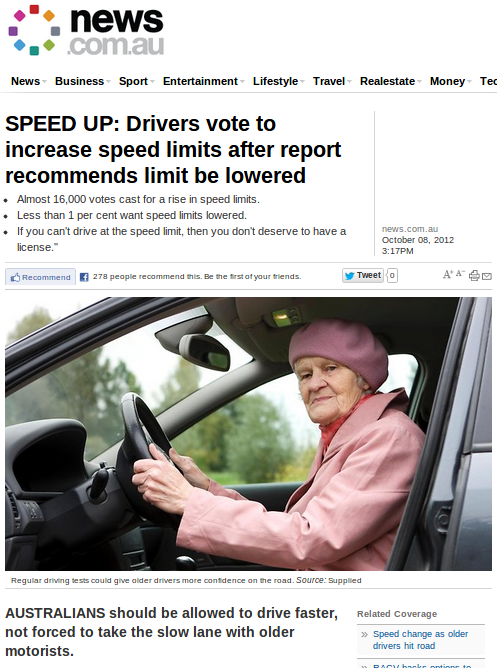 Last week, News Corporation ran a story (mirror) about the shock results of an online poll that indicated over 90% of the 16,000 respondents wanted to see a raise in speed limits, despite the poll being paired with an article asking motorists to slow down in consideration for elderly drivers. Well, I have some news for you: Over 15,000 of those votes were mine. 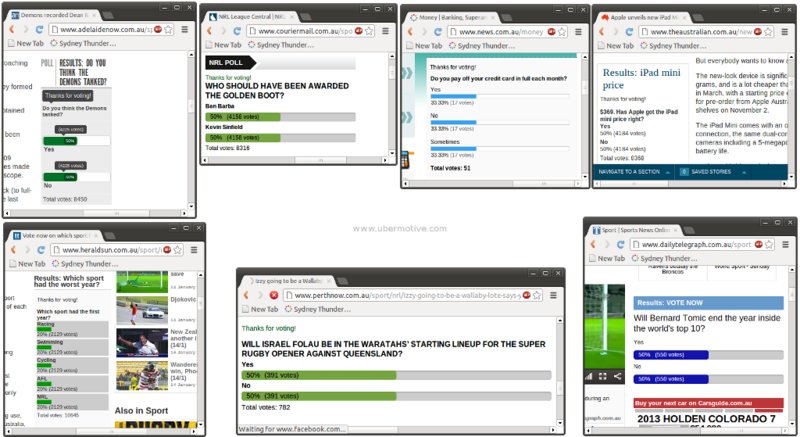 And no, I didn’t cleverly infiltrate their systems and edit the poll by hand. That would have been rather illegal. The fact of the matter is, you can tweak any poll with relative ease without breaking any laws*. All you need to do is capitalise on the fact that there is nothing on their servers that will limit how many times or how often you vote. So there you have it. You can achieve a greater media influence in three lines of bash than Gina Rinehart could with an 18.7% share in Fairfax. * I am not a lawyer. This is not legal advice. UPDATE: Despite alerting NewsCorp to this, nobody seems to be listening. It appears that poll hacking is now my part-time hobby indefinitely. An attempt to bring back the McGratin. I wonder when they’ll realise they’ve been had. 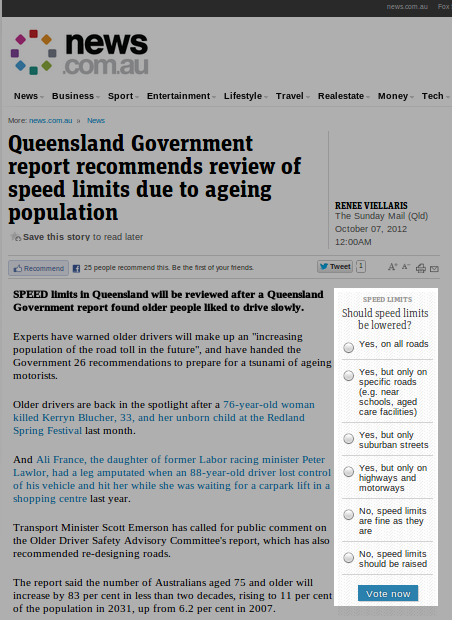 The second article didn’t only reference the poll, it formed the entire premise of the article. It has since been removed (19/12/2012) mirror. Today, a colleague emailed one of the authors of one of the articles to ask if they were curious as to why their poll result was deadlocked… and we actually got a response! This was collectively our fourth attempt at contacting them, and we have again provided all of the details to date. As usual, after spilling the beans, we don’t get a response. However, two days later, the first Facebook poll appears. This may be a stop-gap measure while they fix their own system, or perhaps they’ve switched permanently who knows. It really shows my OCD side, doesn’t it? UPDATE [19/12/2012]: Well, that escalated quickly (reddit helped). It appears that all references to polls (including the polls themselves) in the aforementioned articles have been removed. The articles which were based entirely on a poll result have been expunged entirely. I’ve put up mirrors for anyone who wants to see the originals. Still no word from NewsCorp. I’m just speculating here, but it looks like they’re sweeping the whole thing under the rug. Looking out my front window, there are no sightings of a party van. 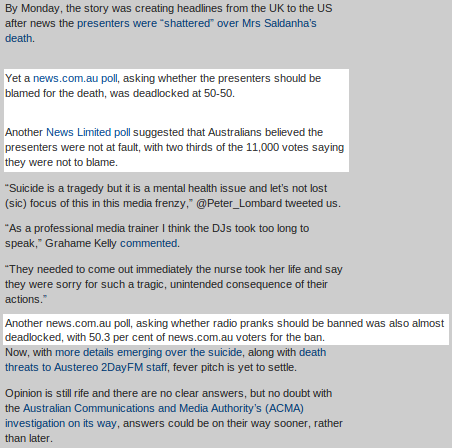 UPDATE [14/01/2013]: So, I stopped gaming the polls on news.com.au after they noticed my blog and cleaned up their articles. I’d assumed that was the end of it. 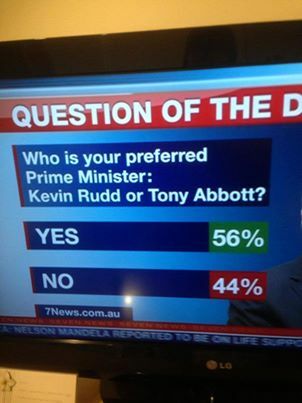 SMH were pretty quick to admit it when a Fairfax poll got hacked a year ago. The difference is that that they actually fixed their polling system, and added a disclaimer. 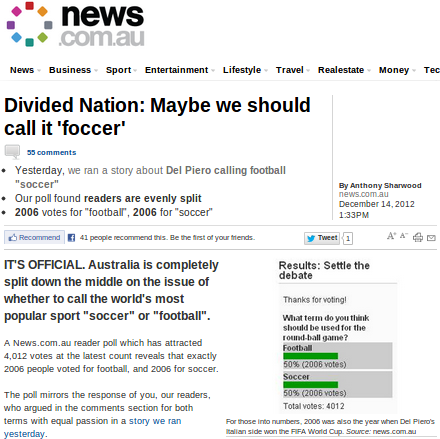 It seems NewsCorp need a little more of a nudge. You know what? I think I’ll leave this running 24/7. Here’s a live view of the polls being deadlocked. UPDATE [06/02/2013]: Four months after being notified, they appear to have limited the amount this can be exploited. 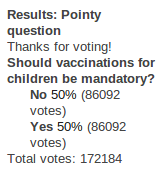 After 10 votes in a short timespan, subsequent votes originating from the same IP address are rejected. 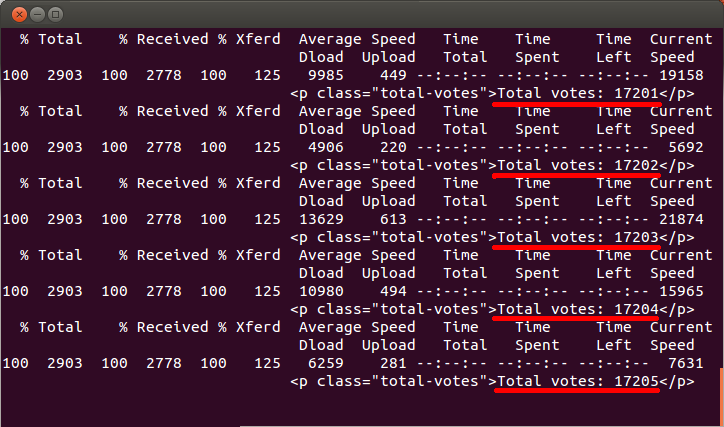 While changing your IP address between votes isn’t an impossible task to automate (using a tor proxy), it’s still orders of magnitude more difficult to do than the original exploit. UPDATE [11/02/2013]: I must admit, the new changes to NewsCorp’s polling system made it much harder to break. Instead of three lines of bash, it now takes eight! They’re reporting on poll results like it’s a trustworthy source. 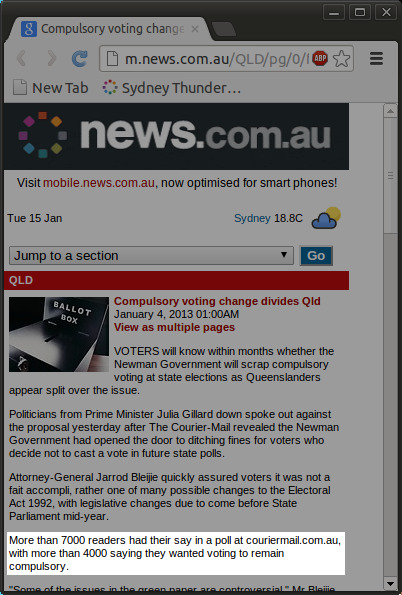 The 7 News online polling system is NOT secure. I must admit, I was going around in circles for a solid hour before I figured out which cookie was required, and what I had to forward to the server to make it send it. At the end of the day, it’s a simple rinse-and-repeat process just like the others. Their server is a bit of a pig, so you’ll need to get several threads happening to speed this one up. on my very own page. Do you really care in the event I actuallydo? I don’t always read articles, but when I do… MY GOD they are great. 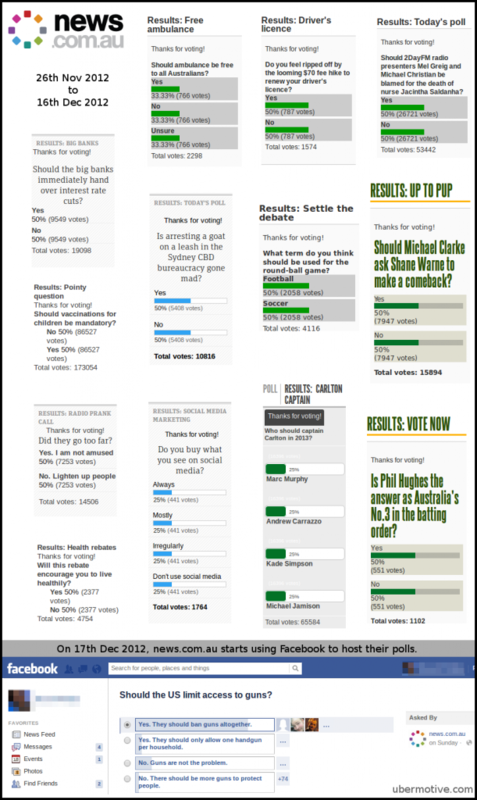 I did this for should “Jedi be recognised as real religion” poll that news corp ran 🙂 The poll results of yes! yes! yes! disappeared after they didn’t get the results they wanted…. that would have been before you got into doing this…..